Vulcan Snow Park is a family-friendly event. Please comport yourself with conduct and language appropriate to the presence of children. We pride ourselves in a friendly, supportive competition environment. Have fun, visit with your fellow sculptors, and feel free to lend and borrow tools as needed. Watch out for the safety of yourself, your fellow sculptors, and visitors and alert them to potentially dangerous situations. When possible, take time to greet, welcome, and thank visitors. Tell them about your sculpture and your team and answer questions about the competition. Encourage visitors to attend the amateur contest awards presentation on Saturday, vote for their favorite state competition sculpture on Sunday, and attend the state competition awards presentation on Sunday. Be familiar with the rules. ​Each state competition team receives a block of compacted snow measuring eight feet long, eight feet wide, and eight feet high (8' x 8' x 8'). Blocks are assigned by random drawing during the Thursday night sculptors’ welcome reception. Teams may exchange blocks at that time by mutual agreement. 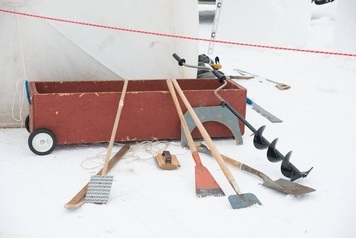 A warming trailer is available for sculptors and volunteers from approximately 7:00 am to 10:00 pm each day of the competition. It will be well stocked with hot and cold beverages, snacks of all kinds, and ready-to-heat frozen food like pizza. Take time away from your sculpture to warm up, relax, chat with your fellow sculptors, and grab a bite to eat. Snow pushers, buckets, and water are available for the shared use of all sculptors. Teams may ask competition personnel for mechanical (front-loader) assistance in moving large amounts or chunks of snow. Competition personnel will regularly use heavy equipment to remove unwanted snow pushed into the plow lanes by sculptors. The times for this day may change. Stay tuned! - You are welcome to submit your own vote! *Site conditions permitting, teams may work through the night at their discretion. Check with the competition organizers.